Hop Nation has already proven to be a brewery that knows its way around an IPA. The Chop is one of the best loved of those coming from Melbourne breweries and is but one of many variants they've released in their relatively short lifespan. 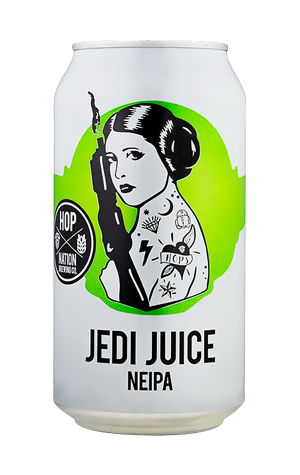 For the 2017 GABS Festival, they added another: Jedi Juice, the latest beer to be added to the growing collection of hazy New England style IPAs from local brewers. It's not their first crack at the style either, with this one a showcase of many of the most extravagant hops on the planet: Riwaka, Idaho 7 (in hop hash form), Nelson Sauvin, Citra and Mosaic. The beer delivers on the haze, while stopping short of the soupy gloop of some beers of this ilk, as well as delivering on the juicy, citrusy hop aromas and flavours one expects of the style. More NEIPAs like this locally and the craze may be here to stay.